Kingdom Hearts Birth by Sleep (Japanese: キングダム ハーツ バース バイ スリープ, Hepburn: Kingudamu Hātsu Bāsu bai Surīpu) is an action role-playing video game developed and published by Square Enix for the PlayStation Portable, serving as the sixth installment in the Kingdom Hearts series. The game was released on UMD in Japan on January 9, 2010, in North America on September 7, 2010 and in the PAL regions on September 10, 2010. An international version of the game titled Kingdom Hearts Birth by Sleep Final Mix was released in Japan in January 2011 featuring the changes made in the non-Japanese versions. The game utilizes an overhauled battle system different from previous games in the series with new elements. It is a prequel to the original Kingdom Hearts, taking place ten years before. The game centers on the journeys of Terra, Aqua and Ventus, characters briefly featured in Kingdom Hearts II in their quest to locate the missing Master Xehanort, and protect the worlds from creatures known as the Unversed. The player has access to the three characters' different scenarios when playing. Development of the game began in June 2005 with parts of the game Kingdom Hearts II Final Mix meant to bring clues of Birth by Sleep. The game was directed by Tetsuya Nomura and co-directed by Tai Yasue. Nomura has referred to the game as "Episode 0" (and later "Episode 0.1" following the release of Kingdom Hearts χ) saying that the game is on the same scale and plays as big an importance as Kingdom Hearts and Kingdom Hearts II. The game has been well-received, selling 1.27 million copies worldwide as of November 2010, and receiving positive comments by video game publications. Critics praised the gameplay, graphics, music, and storyline of the game, with criticism reserved for the level design and the characters. A high definition version of the Final Mix edition was released for the PlayStation 3 in 2014 and PlayStation 4 in 2017 as a part of the Kingdom Hearts HD 2.5 Remix collection. Terra battling the Trinity Armor with Aqua and Ventus. Birth by Sleep is an action role-playing game with hack and slash elements that introduces a gameplay aspect to the series called the Command System. This system allows players to customize a Command Deck with techniques and abilities that they can perform at will, called Deck Commands. Performing ordinary attacks and Commands fills a gauge displayed above the Command Deck. When certain requirements are fulfilled and the gauge is full, the player's basic attack is changed to the "Surge" Command, which racks up powerful combos depending on what Command Style is activated. Filling the gauge a second time replaces the "Surge" Command with the more powerful "Storm" Command. Unlike previous games in the series, the game does not utilize Magic Points (MP) for spells or magic casting. It instead uses a system known as Focus, which is displayed in an orange gauge on the interface. The player can use Focus to perform a technique called Shotlock with which the player enters a first person mode where they target enemies to cast homing spells that differ with each character and technique, depleting the gauge relative to the number of enemies targeted. Once depleted, the Focus gauge gradually refills with every attack and Deck Command the player lands on an enemy. Another aspect introduced in the game is the Dimension Link (D-Link), measured in a blue gauge on the interface. It is used to draw power from certain companions who the player characters meet during the game, such as Experiment 626, temporarily replacing the commands in the player's customized command deck with a pre-determined set of commands that differ with each D-Link. Once the command gauge is filled while performing a D-Link, a powerful finishing move is activated to take out enemies. Each finishing move has two levels which can render a finishing move more powerful than before, similar to that of the Command System. The D-Link can only be used when its corresponding gauge is filled completely, and can be activated by pressing right on the directional pad to access the D-Link menu, followed by selecting the chosen ally. The game also features the Command Board, which appears whenever the player completes a world, and can be accessed from save points and the world map once unlocked. Each world has its own unique Command Board with its own tricks and mechanisms. The Command Board plays like a simplified version of the Fortune Street board game series. A die is thrown and the player moves, with each space having its own unique effect on the player. Various Disney characters from throughout the game also appear on their respective Command Board to either aid or hinder the player. Special panels in the board game can trigger "special events" when landed on by the player. The game is divided into three separate scenarios, with each one surrounding the story of the three main characters: Terra, Aqua and Ventus. While the first ten minutes of the story are the same regardless of which character is chosen, the events that follow differ in each scenario, with each character's narrative occurring parallel to the others and intersecting with one another at different points. The gameplay of each scenario differs based on the abilities of each character such as their power, speed and magic: Terra is the most powerful in terms of physical damage, Ventus is the fastest character and Aqua specializes in magic. Players may choose which of the three scenarios they wish to start with near the beginning of the game. The recommended scenario order of play by Nomura is Terra, followed by Ventus, and lastly Aqua, allowing the player to best understand the story. Completing all three scenarios will unlock the story's final chapter. The game supports up to six players at a time in four new multiplayer modes, all set in a world known as the Mirage Arena. In each mode, players control one of the three main characters. In Versus, players fight against each other in a deathmatch-style game, while in Arena players fight co-operatively in a "Survival Mode" style of gameplay against wave after wave of Unversed. Rumble Racing features players racing against each other competitively on their Keyblade vehicles, which can also be used to attack rivals. Command Board is a board game using the in-game Command Board mechanic, where players try to reach the end first as in traditional board games. Setting records in the Mirage Arena earns players medals which can be exchanged for rare items in-game. Only Ad-Hoc wireless multiplayer, where all of the players need to be physically near each other, is allowed. Birth by Sleep is a prequel to the first Kingdom Hearts game, taking place ten years prior. Like the other games in the series, the player progresses through a collection of various worlds, based on various locales from the Disney animated features canon: Dwarf Woodlands from Snow White and the Seven Dwarfs, Enchanted Dominion from Sleeping Beauty, Castle of Dreams from Cinderella, Olympus Coliseum from Hercules, Deep Space from Lilo & Stitch, Neverland from Peter Pan and Mysterious Tower from Fantasia. The game also features various new worlds specially created for the series by Square Enix such as the Land of Departure and Radiant Garden. Disney Town, which is the town that surrounds the castle grounds of Disney Castle, serves as the game's minigame world. Worlds such as Destiny Islands and Castle Oblivion also appear in the form of cutscenes, while the 100 Acre Wood from the Winnie the Pooh franchise, which had appeared in most other games of the series, only appears as a Command Board in Birth by Sleep. The staff first chose the worlds based on the game's scenario, leading to the inclusion of Princesses' worlds. They then added the worlds of Neverland and Deep Space to add variety to the game, while Olympus Coliseum was selected to reflect the game's earlier setting compared to the original Kingdom Hearts. The three main characters are Terra, Aqua, and Ventus, a trio of Keyblade apprentices under Master Eraqus who aspire to become Masters themselves. Another Keyblade Master, Xehanort, and his apprentice, Vanitas, serve as the game's antagonists. Other characters from the previous games return, such as younger versions of Sora, Riku, and Kairi, though they are given less prominent roles. A number of characters who later come to form Organization XIII also appear in their human forms. As with the Heartless in Kingdom Hearts and the Nobodies in Kingdom Hearts II, Birth by Sleep introduces a new type of enemy: the Unversed, fledgling emotions that are "not well-versed in their own existences" and feed on negativity. As with the other games in the series, Birth by Sleep features an extensive cast of Disney characters. The most prominent of these characters is Mickey Mouse, the king of Disney Castle, who serves as a Keyblade apprentice under the sorcerer Yen Sid at this point in the series chronology. Donald Duck and Goofy, who assist Sora in most other games, appear in smaller roles. Most other Disney characters remain in their respective worlds regardless of their overall importance to the story in previous installments, such as Maleficent and Pete, who served as major antagonists between Kingdom Hearts and Kingdom Hearts II, and a number of the Princesses of Heart. Some characters (such as Experiment 626, Prince Phillip, and Mickey) occasionally fight alongside the player characters in battles as partners similar to the other games, providing assistance and performing combos to help the player proceed. However, they do not follow the player around constantly like Donald and Goofy in the other games. Unlike the other major installments, which also featured casts of various characters throughout the Final Fantasy series, Birth by Sleep only features two of these characters: Zack Fair from Final Fantasy VII, and the Moogles, creatures from several of the Final Fantasy games, who sell items to the player. As Birth by Sleep is a prequel of the first Kingdom Hearts title, the staff decided to add Zack to the title as he is the protagonist of the Final Fantasy VII prequel, Crisis Core: Final Fantasy VII. Master Xehanort brings a comatose Ventus to the Destiny Islands after the latter's heart is damaged; a newborn heart senses Ventus's heart and connects with it, saving him. Years later, at the Land of Departure, Terra and Aqua take an exam to achieve the Mark of Mastery. Xehanort manipulates the exam so Terra fails while Aqua passes, lessening Terra's control of the darkness in his heart. Shortly afterward, Xehanort disappears and a horde of Unversed appear throughout the worlds. Learning about these developments from Yen Sid, Master Eraqus sends Terra and Aqua to destroy the Unversed and find Xehanort throughout the countless worlds. Meanwhile, Vanitas convinces Ventus to follow Terra against Eraqus's wishes, while Eraqus orders Aqua to monitor Terra's darkness and bring Ventus back to the Land of Departure. As the three travel through several worlds, Terra attracts the attention of several villains, who offer him the whereabouts of Xehanort in exchange for assistance in their own agendas. He eventually finds Xehanort, who offers to take him in as his apprentice and urges him to use his inner darkness to gain power. He further instructs him to destroy Vanitas, the source of the Unversed, who was created from the darkness extracted from Ventus's heart. Shortly afterward, the three friends reunite at Radiant Garden, but a schism forms between them when they have an argument over Terra's presumed actions in the other worlds. Ventus encounters Xehanort, who reveals his intention to recombine Ventus and Vanitas's hearts to create an all-powerful Keyblade called the χ-blade. Xehanort sends Ventus to the Land of Departure to confront Eraqus, who attempts to destroy Ventus to foil Xehanort's plan. Terra arrives to save Ventus and fights with Eraqus; upon his defeat, Eraqus is vanquished by Xehanort, who enshrouds the Land of Departure in darkness and tells Terra to go to a world known as the Keyblade Graveyard. Ventus is instructed to do the same by Vanitas, as is Aqua by Yen Sid upon being informed of Eraqus's demise at Xehanort and Terra's hands. Terra, Aqua, and Ventus reunite at the Keyblade Graveyard, where Xehanort and Vanitas reveal their plan to use the χ-blade to unlock Kingdom Hearts and start a Keyblade War, an apocalyptic event that nearly destroyed the world in the past. Terra's heart is swallowed by darkness in the ensuing battle, and Xehanort takes over his body to replace his own aging one. However, Terra's mind remains within his discarded suit of armor, which comes to life and defeats Xehanort. Meanwhile, Ventus is forced to fuse with Vanitas to create the χ-blade. Aqua and Mickey fight with the possessed Ventus and destroy the χ-blade, while Ventus engages and defeats Vanitas in a metaphysical battle within his own mind, losing his heart and falling into a catatonic state as a result. After learning of Ventus's condition from Yen Sid, Aqua brings his body to the Land of Departure, which she transforms into Castle Oblivion to ensure Ventus will not be disturbed. At Radiant Garden, Aqua battles the possessed Terra. When Terra struggles for control of his body, Xehanort impales himself with his own Keyblade, causing him to sink into the realm of darkness. Aqua dives into the realm and rescues Terra, becoming trapped in the process. Ansem the Wise finds an amnesiac Xehanort still possessing Terra's body, while Ventus's heart reconnects with and rests inside the heart of a young Sora, the newborn who had previously saved him on the islands. In the game's secret ending, which takes place after the events of Kingdom Hearts II, Aqua meets Ansem in the realm of darkness and learns from him about Sora, who has the power to save those connected to his heart. Sora has learned of Terra, Ventus, and Aqua's fates from a letter sent by Mickey, and undertakes another quest to save them. Development of the game began in June 2005 and was originally intended for the PlayStation 2 with Sora as the prototype protagonist of the game. Birth by Sleep was developed by Square Enix's fifth Product Development Division, based in Osaka, the same team behind Kingdom Hearts Re:Chain of Memories, and uses the same graphical engine as both Crisis Core: Final Fantasy VII and Dissidia Final Fantasy. During development of Kingdom Hearts II, the Osaka-based team had requested to be involved in a spin-off if one were to be made. Development of the game began before the release of Kingdom Hearts II Final Mix+. The plot was completed, but development was halted six months after it began due to development of Re:Chain of Memories. When development resumed, the team changed the platform to the PlayStation Portable so as to make use of the PSP's functions such as co-operative and competitive multiplayer gameplay. The title of the game is based on II Final Mix's secret ending, "Birth by Sleep", a title which director Tetsuya Nomura developed as he wanted a phrase having "by" as well as to use an English title like previous games. Nomura has referred to the game as "Episode 0", saying that the game is on the same scale and plays as big an importance as Kingdom Hearts and Kingdom Hearts II. Early during the game's development, Nomura already had various scenes in mind such as Terra's and Riku's conversation in order to explain the latter's ability in the original games. Various parts from the plot had to be modified to make the game more light-hearted such as Eraqus' death at the hands of Xehanort after being defeated by Terra, how Aqua's scenario was supposed to end with her already trapped in the Realm of Darkness, and the relationship between Ventus and Sora. Two of the newly introduced protagonists, Ventus and Terra, were based on other characters from the franchise while Aqua's design did not have a base. Nevertheless, the three wear outfits meant to expand the student-and-teacher bond shown in the game. The Disney worlds were chosen to expand the characters of the Princesess of Light as well as Maleficient's who are connected with the events of the first Kingdom Hearts game, while the worlds of Neverland and Deep Space were chosen to add variety to the game, and Olympus Coliseum was selected to reflect the game's earlier setting compared to the original Kingdom Hearts. Birth by Sleep was directed by Nomura and co-directed by Tai Yasue. It was announced alongside Kingdom Hearts 358/2 Days and Kingdom Hearts coded at the Tokyo Game Show on September 20, 2007, where a trailer was shown in a photo-prohibited theater. New trailers were shown at the 2008 Jump Festa in December 2007 and the DKΣ3713 Private Party, an invite-only event by Square Enix for fans, in August 2008; a playable demo was also available at DKΣ3713. The June 5, 2009 issue of Famitsu covered an interview with Tetsuya Nomura, where he said that the game was, at the time, at the voice recording stage. Nomura also confirmed in an interview that Birth by Sleep would contain a secret ending like in Kingdom Hearts and Kingdom Hearts II for the next game in the Kingdom Hearts series, which he confirmed to be a main game and the one which Nomura stated would link up Birth by Sleep, 358/2 Days and coded. He also confirmed that a Birth by Sleep demo would indeed be playable at the 2009 Tokyo Games Show together with a new trailer. In early October 2009, Nomura revealed that the concept of the Command Board originated from when he was in elementary school as at that time he was very fascinated with board games and even made his own; hence he wanted to incorporate a fun board game into the game. 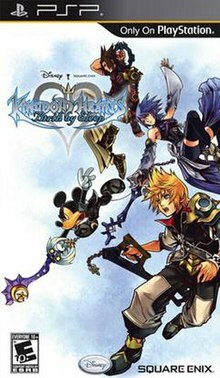 In late October 2009, Nomura revealed that he was currently designing the cover art for Birth by Sleep as well as editing the staff rolls due to there being three main characters in the game. He also revealed that they were editing the new opening movie for the game. As with coded and 358/2 Days, Yoko Shimomura, the series' main composer, composed the most prominent themes, while the rest was created by other composers. Like Kingdom Hearts and Kingdom Hearts Re: Chain of Memories, Birth by Sleep uses Hikaru Utada's theme song "Hikari" for the Japanese version and its English version, "Simple and Clean", in the other releases. The game made its final public appearance before its Japanese release at Jump Festa 2010 on December 19, 2009 where a playable demo as well as new footage from the game were present and shown. Like previous console titles in the series, the game contains a secret movie at the end, which had been described as being more like a "true ending" rather than a teaser for the future like previous ones. Development of the movie began in October where Nomura noted in the blog that the game would contain a teaser to the next major Kingdom Hearts game similar to the teasers in previous games in the series. The game sold very well during its first two days of release with over 500,000 copies of the game sold in Japan. By February 14, just over a month later, the game had sold a total of 800,551 copies. Sales in North America and Europe have also been good, with the game taking high places in various categories. After its release in the United States, it was listed as the sixth bestselling video game there in September 2010 by the NPD Group. By November 2010, the game had sold 1.27 million units worldwide with 310,000 and 190,000 copies coming from North America and Europe, respectively, and the rest from Japan. In November 2011, Sony announced Birth by Sleep would receive the "Gold Prize" for selling over 500,000 units in Japan. Prior to the game's release, IGN expressed their excitement at the release of the game in 2010 having played the demo. 1UP.com echoed similar statements, praising the visuals and stating it "plays better" than the previous Kingdom Hearts games. They had some complaints regarding Ven's demo due to constant jumping, but further stated that Ven's demo gave them an idea of "how the game is going to feel", and predicted the game would improve the series. 1UP also put it on their article "Top 10 PSP Games of 2010", while Gamasutra put it in their "The Most Anticipated Games Of 2010" and "The Most-Awaited Games Of 2009: PlayStation Portable" articles. IGN featured it as nominated of 2010's "Best of E3 Award" in the category Best PSP Games. GameTrailers also had praise for the new title and gave it a nomination for Best PSP Game of E3 2010. Kingdom Hearts Birth by Sleep has received positive reviews from gaming reviewers. The game's average score is of 82 out of 100 on Metacritic, becoming the fourth highest ranking Kingdom Hearts game behind Kingdom Hearts, Kingdom Hearts II, and Kingdom Hearts III. The game has been highly praised by Japanese gaming magazine, Famitsu, whose four reviewers gave scores of 10/9/9/9, for a total of 37/40, the third-highest rated game in the Kingdom Hearts series behind Dream Drop Distance and Kingdom Hearts II. They praised the game's graphics and music, calling them "superb", as well as praising the wide variety of customization available to the players due to the three unique playable characters. It also praised the design of boss battles, calling them "lively and exciting". English websites have also given praise to the game with GameZone calling it "amazing title that every KH fan must play", finding it the best portable game from the series. RPGamer praised the "evolution" from the gameplay ever since the series' start. PlayStation: The Official Magazine (PSM) agreed calling the fighting system "one of the deepest, most rewarding" ones from the PSP. IGN called its battle system "unique", labeling it as the best one from all the series and having a campaign story. 1UP praised the differences between the protagonists' fighting styles with PSN comparing them with different classes of RPG characters. A common complaint has been the game's loading times, which tended to be very long depending on the PlayStation Portable's memory. Reviewers also called the game's worlds "hollow due to the lack of interaction, and also criticized the game's camera which sometimes made fights confusing. Visuals were also well received for being similar to the ones from PlayStation 2's games with praise on the design of the worlds, although a lack of details was also noted. Sites have also praised the game's story, for its accessibility as a result of being a prequel, or that it did not bear elements from previous games that tended to confuse gamers such as the characters' identities. Critics also appreciated how the story is told from three different perspectives, which helped to give different point of views as well as expand the time the game can be played. Nevertheless, some character traits were criticized such as the similarities between the protagonists to previous ones. While Eurogamer cited that the three characters had little impact to the Disney worlds' storyline, Terra's role was praised by 1UP.com for distancing itself from previous scenarios. Although the lack of Final Fantasy characters received mixed opinions, PSM thought that it helped to expand the exploration of Disney worlds, while Zack's role was found suitable by GameZone. The English casting for Birth by Sleep also received positive comments with GameTrailers stating that it "features one of the few good English dubs in recent memory", particularly Leonard Nimoy's performance. GameSpot stated that Ventus' and Aqua's voice actor to have done a good job voicing them, but criticized Terra's as one of the worst ones from the game, most notably, when compared with other well-received actors. IGN featured the game in their "Game of the Month" article series for September 2010 in the PSP category. The game has been listed as one of the best PlayStation Portable titles with GamesRadar placing it sixth and IGN eighteenth. In an ASCII Media Works poll, it was listed as the tenth best game of 2010. It won in the category of "Best Portable Console Videogame" in France's 2011 Japan Expo. Kingdom Hearts Birth by Sleep was also released with a limited edition PSP-3000 as a bundle in Japan featuring designs from the Kingdom Hearts series on its back. On March 16, 2010, Square Enix announced the English version of the game, which was released on September 7, 2010 in North America, and on September 10, 2010 in Europe. The English version of the game contains some adjustments from the original version, such as a new difficulty setting called Critical Mode, and additional songs for the Ice Cream Beat minigame. A new boss known only as the Unknown appears in the overseas versions, as well as a new gameplay element called "Crown Stickers", which act much the same way as the Puzzle Pieces from Kingdom Hearts II Final Mix. The game also has a notable voice-acting cast of returning members such as Jesse McCartney and James Woods, as well as numerous new actors such as Willa Holland, Jason Dohring, Leonard Nimoy, and Mark Hamill. An Ultimania guidebook of the game was released on March 25, 2010. Like previous games, a light novel of Birth by Sleep has been written by Tomoko Kanemaki and illustrated by Shiro Amano. Its first volume, "Something Strange" was published by Square Enix on December 24, 2010, the second - "Best Friends" - on February 24, 2011, and the third and final volume, "To the Future", on May 26, 2011. Additionally, the tracks featured in the game have been released as part of a three-disc album which includes the soundtracks from Birth by Sleep, 358/2 Days and coded. In early 2010, Nomura was asked in an interview if Square Enix would release an international Final Mix of Kingdom Hearts Birth by Sleep, to which he replied he would like to, as he enjoyed the work from the English voice casting done in the previous games. However, he stated that one of the main reasons for the popularity of the Final Mix version of Kingdom Hearts II was because it was released alongside the PlayStation 2 remake of Kingdom Hearts: Chain of Memories, so he and the staff would think on it more. In September 2010, Square Enix announced that Kingdom Hearts Birth by Sleep Final Mix would be released on January 20, 2011 in Japan. Like all Final Mix releases, it combines English audio with Japanese game text and subtitles, and includes all additional features implemented in the Western versions as well as brand new content, such as a new playable secret episode for Aqua, which takes place after the events of the final episode, and also has new cutscenes with dialogue provided by her voice actress Megumi Toyoguchi, which were later dubbed into English by Aqua's english voice actress Willa Holland for the HD 2.5 Remix release. The events of the secret episode would tie-in to the later A Fragmentary Passage release. Alongside The 3rd Birthday, Final Mix includes a code that allows players to obtain downloadable content for Dissidia 012 Final Fantasy, with Final Mix featuring the character Cloud Strife costume from the original Kingdom Hearts. Final Mix topped the video game charts following its release with 77,317 units sold in the first week, and reaching 106,276 in February 2011. Final Mix was released for the first time outside Japan as part of Kingdom Hearts HD 2.5 Remix. In the credits of Kingdom Hearts HD 1.5 Remix, clips of Kingdom Hearts Birth by Sleep Final Mix were shown, hinting at its inclusion in another collection. On October 14, 2013, Square Enix announced Kingdom Hearts HD 2.5 Remix, a second compilation exclusively for the PlayStation 3 after HD 1.5 Remix. The release includes both Kingdom Hearts II Final Mix and Kingdom Hearts Birth by Sleep Final Mix in HD with trophy support. Additionally, the collection includes HD cinematic scenes from Kingdom Hearts Re:coded. It was released in Japan on October 2, 2014, North America on December 2, 2014, Australia on December 4, 2014, and Europe on December 5, 2014. In September 2015, Square Enix announced Kingdom Hearts HD 2.8 Final Chapter Prologue. The collection features Kingdom Hearts 0.2: Birth by Sleep – A Fragmentary Passage, a new game taking place after the events of the original Birth by Sleep, told from the perspective of Aqua. The collection also features an HD remaster of Kingdom Hearts 3D: Dream Drop Distance as well as Kingdom Hearts χ Back Cover, a cinematic retelling of Kingdom Hearts χ that reveals new parts of the series' history. It was released in Japan on January 12, 2017, and in other countries on January 24, 2017. ^ a b c Gantayat, Anoop (October 2, 2007). "Nomura Discusses Kingdom Hearts". IGN. Retrieved January 25, 2010. ^ a b c d e f "A New Chapter In The Kingdom Hearts Series Delivers Three Brand-New Titles To The Nintendo DS, PlayStation Portable, And Mobile Phones". Square Enix. September 21, 2007. Retrieved September 24, 2007. ^ "Kingdom Hearts PSP hits September 7". GameSpot. May 17, 2010. Retrieved September 17, 2010. ^ a b "Kingdom Hearts Birth By Sleep Nets North American Date". PSX Extreme. May 17, 2009. Retrieved May 17, 2010. ^ a b Famitsu (August 28, 2009). "マルチプレイの情報も飛び出した『キングダム ハーツ バース バイ スリープ』". Famitsu. Retrieved September 25, 2009. ^ Yui (January 2, 2008). "KH Birth by Sleep：DKΣ3713" (in Japanese). Archived from the original on November 20, 2008. Retrieved January 3, 2008. ^ a b Parish, Jeremy (September 19, 2007). "Preview - First glimpse of the KH prequel for PSP". 1UP.com. Archived from the original on October 20, 2007. Retrieved September 20, 2007. ^ a b Onyett, Charles (January 19, 2007). "TGS 2007: Three New Kingdom Hearts Titles". IGN. Retrieved September 20, 2007. ^ a b "『キングダム ハーツ バース バイ スリープ』でディズニーキャラクターなどの仲間とリンク！". Famitsu. October 2, 2009. Retrieved November 3, 2009. ^ a b Parish, Jeremy (August 2, 2008). "Previews: Kingdom Hearts PSP". 1UP.com. Archived from the original on August 30, 2013. Retrieved August 8, 2008. ^ "Kingdom Hearts: Birth by Sleep Mini-Games & More". IGN. Retrieved April 11, 2012. ^ a b c d Dengeki Staff (January 15, 2010). "Kingdom Hearts: Birth by Sleep". Dengeki PlayStation (in Japanese). ASCII Media Works: 60–61. ^ a b Famitsu Staff (December 24, 2009). "Interview with Tetsuya Nomura". Weekly Famitsu (in Japanese). Enterbrain: 116–121. ^ a b "KINGDOM HEARTS BIRTH BY SLEEP OPENS THE DOORS TO AN UNTOLD WORLD THIS SUMMER". Square Enix. March 16, 2010. Retrieved March 16, 2010. ^ Famitsu Staff (December 10, 2009). "Interview with Tetsuya Nomura". Weekly Famitsu (in Japanese). Enterbrain: 48–55. ^ a b Famitsu Staff (November 5, 2009). "Interview with Tai Yasue". Weekly Famitsu (in Japanese). Enterbrain: 262–267. ^ "Famitsu Interview". Kingdom Hearts Birth By Sleep Ultimania (in Japanese). Studio BentStuff. March 25, 2010. ISBN 978-4-7575-2788-1. ^ "Kingdom Hearts Birth by Sleep". IGN. Retrieved September 20, 2007. ^ a b c "Kingdom Hearts: Birth by Sleep Q&A". GameSpot. July 19, 2010. Retrieved August 9, 2010. ^ Famitsu Staff (January 14, 2010). "Interview with Tetsuya Nomura". Weekly Famitsu (in Japanese). Enterbrain: 36–42. ^ Yui (August 2, 2008). "KH Birth by Sleep：DKΣ3713初の試遊台出展レポート、新たな敵は「アンバース」" (in Japanese). Archived from the original on November 20, 2008. Retrieved August 3, 2008. ^ Square Enix PDD 5 (September 7, 2010). Kingdom Hearts Birth by Sleep. PlayStation Portable. Square Enix, Disney Interactive Studios. Eraqus: Not only from the forces of darkness, as you may assume...but also from a new threat—one that feeds on negativity. Fledgling emotions that have taken monster form—Yen Sid calls them the "Unversed." ^ Jump Staff (December 1, 2009). "Kingdom Hearts: Birth by Sleep". Weekly Shōnen Jump (in Japanese). Shueisha: 20. ^ Square Enix PDD 5 (September 7, 2010). Kingdom Hearts Birth by Sleep. PlayStation Portable. Square Enix, Disney Interactive Studios. Xehanort: There, you see? An empty world, like a prison. I imagine you'll be right at home. ^ Square Enix PDD 5 (September 7, 2010). Kingdom Hearts Birth by Sleep. PlayStation Portable. Square Enix, Disney Interactive Studios. Voice: I'm a brand new heart. /.../ Ventus: But my heart is fractured. And now...the little I have left is slipping away. / Voice: Then you should join your heart with mine. /.../ Voice: Now our hearts have touched. Nothing else will slip away. ^ Square Enix PDD 5 (September 7, 2010). Kingdom Hearts Birth by Sleep. PlayStation Portable. Square Enix, Disney Interactive Studios. Eraqus: Eliminate the Unversed and find Master Xehanort. I have unlocked the Lanes Between. You may use these forbidden pathways to travel between this world and countless others. ^ Square Enix PDD 5 (September 7, 2010). Kingdom Hearts Birth by Sleep. PlayStation Portable. Square Enix, Disney Interactive Studios. Vanitas: Or you'll never see Terra again. / Ventus: What? Get real? I can see Terra anytime I want. / Vanitas: Like right now? He's leaving you behind. And by the time you catch up...he'll be a different person. ^ Square Enix PDD 5 (September 7, 2010). Kingdom Hearts Birth by Sleep. PlayStation Portable. Square Enix, Disney Interactive Studios. Eraqus: I told Terra this could be a second chance to show the Mark of Mastery...and I meant it. However, that flicker of darkness he displayed during the examination—I can sense it runs very deep. If he were to— If those powers were to prove too much for him to handle, I want you to bring him back to me at once. It's for his own good. I could not bear to lose any of you to the darkness. / Aqua: Of course. I would never let that happen. I promise you I will bring Terra back. Only this time, you'll see he has what it takes to be a Master. He's not as weak as you think. ^ Square Enix PDD 5 (September 7, 2010). Kingdom Hearts Birth by Sleep. PlayStation Portable. Square Enix, Disney Interactive Studios. Aqua: Wait, Ven! / Eraqus: No! He mustn't! You have to bring him back! ^ Square Enix PDD 5 (September 7, 2010). Kingdom Hearts Birth by Sleep. PlayStation Portable. Square Enix, Disney Interactive Studios. Xehanort: Vanitas uses the Keyblade to sow seeds of darkness. /.../ Terra: The Unversed! /.../ Xehanort: Lend you me your strength, Terra. Right this wrong what I have wrought. ^ Square Enix PDD 5 (September 7, 2010). Kingdom Hearts Birth by Sleep. PlayStation Portable. Square Enix, Disney Interactive Studios. Terra: It might be a different route, but I'm fighting the darkness. / Aqua: I'm not so sure. I've been to the same worlds as you and I've seen what you've done. You shouldn't put yourself so close to the darkness. / Ventus: Listen to yourself, Aqua. Terra would never— / Terra: You mean you've been spying on me? Is that what he said to do? The Master's orders? / Aqua: He was only— /.../ Terra: Just stay put! I'm on my own now, all right? ^ Square Enix PDD 5 (September 7, 2010). Kingdom Hearts Birth by Sleep. PlayStation Portable. Square Enix, Disney Interactive Studios. Xehanort: Pure light against pure darkness, to forge the ultimate key. The all-powerful χ-blade! / Ventus: And I have the power to make it? ^ Square Enix PDD 5 (September 7, 2010). Kingdom Hearts Birth by Sleep. PlayStation Portable. Square Enix, Disney Interactive Studios. Eraqus: The χ-blade has no place in this or any world. Xehanort has made his purpose clear...and I am left with no choice. Forgive me...but you must exist no more. ^ Square Enix PDD 5 (September 7, 2010). Kingdom Hearts Birth by Sleep. PlayStation Portable. Square Enix, Disney Interactive Studios. Eraqus: Why do all my attempts to reach you fail? If you don't have it in your heart to obey... then you will have to share Ventus's fate. /.../ Terra: You may be my master...but I will not...let you hurt my friend! ^ Square Enix PDD 5 (September 7, 2010). Kingdom Hearts Birth by Sleep. PlayStation Portable. Square Enix, Disney Interactive Studios. Xehanort: Still so blind... Then I will make you see. Come to the place where all Keyblade wielders leave their mark on fate—the Keyblade Graveyard! There you will watch your dear Ventus and Aqua meet their ends, and the last light within you will die! ^ Square Enix PDD 5 (September 7, 2010). Kingdom Hearts Birth by Sleep. PlayStation Portable. Square Enix, Disney Interactive Studios. Vanitas: The Keyblade Graveyard. There you're gonna see me choke the life out of Terra and Aqua. Then we'll see how long you play the pacifist. ^ Square Enix PDD 5 (September 7, 2010). Kingdom Hearts Birth by Sleep. PlayStation Portable. Square Enix, Disney Interactive Studios. Yen Sid: Aqua, the stars bring me grave news. Master Eraqus's star has blinked out. I am afraid that means he has been struck down. / Aqua: The Master? But— Who is responsible? / Yen Sid: Master Xehanort...and Terra. / Aqua: No! That's absurd! Terra would never! / Yen Sid: I hope with all my heart that you are right about your friend. There are some things even the stars cannot tell me. Terra's heart is leading him to the ancient Keyblade Graveyard, where wielders of those weapons once waged war. ^ Square Enix PDD 5 (September 7, 2010). Kingdom Hearts Birth by Sleep. PlayStation Portable. Square Enix, Disney Interactive Studios. Terra-Xehanort: Your body submits. Your heart succumbs—so why does your mind resist? ^ Square Enix PDD 5 (September 7, 2010). Kingdom Hearts Birth by Sleep. PlayStation Portable. Square Enix, Disney Interactive Studios. Vanitas: Correct. I am not Ventus. His heart has become a part of mine now. ^ Square Enix PDD 5 (September 7, 2010). Kingdom Hearts Birth by Sleep. PlayStation Portable. Square Enix, Disney Interactive Studios. Vanitas: Our union was not finished. The χ-blade shouldn't stay broken like this. Join me now, and we can complete the χ-blade! / Ventus: I've got a better idea. How 'bout I destroy you both? / Vanitas: The χ-blade is made of your heart, too, idiot. If you destroy it, your heart will vanish forever. / Ventus: Whatever it takes. Anything to save Terra and Aqua. ^ Square Enix PDD 5 (September 7, 2010). Kingdom Hearts Birth by Sleep. PlayStation Portable. Square Enix, Disney Interactive Studios. Aqua: Ven! Ventus! / Yen Sid: The boy's heart is sleeping. / Aqua: When will he wake? / Yen Sid: I could not say. It is almost as though his heart has left. ^ Square Enix PDD 5 (September 7, 2010). Kingdom Hearts Birth by Sleep. PlayStation Portable. Square Enix, Disney Interactive Studios. Eraqus: Just use the key, and this land will be transformed. From that day forward, all who visit this land will be lost to oblivion, none ever able to solve the mystery. None, Aqua, except you. / Aqua: I know it's a lonely place, but you'll be safe. Terra and I will be back to wake you up before you know it. ^ Square Enix PDD 5 (September 7, 2010). Kingdom Hearts Birth by Sleep. PlayStation Portable. Square Enix, Disney Interactive Studios. Terra-Xehanort: Terra's heart has been extinguished—smothered by the darkness within him. / Aqua: My name is Master Aqua. Now return my friend's heart or pay the price! ^ Square Enix PDD 5 (September 7, 2010). Kingdom Hearts Birth by Sleep. PlayStation Portable. Square Enix, Disney Interactive Studios. Terra-Xehanort: Stop fighting back! / Aqua: Terra, I know you're in there! / Terra-Xehanort: This will teach you. Get out of my heart! ^ Square Enix PDD 5 (September 7, 2010). Kingdom Hearts Birth by Sleep. PlayStation Portable. Square Enix, Disney Interactive Studios. Sora: Hey, can you hear me? / Ventus: I heard your voice. It cut through the darkness around me. All alone, I followed the sound into a sea of light and found myself here, with you. You gave me back something when I needed it the most. A second chance. / Sora: I did? / Ventus: But... now I have to go back to sleep again. / Sora: Are you sad? / Ventus: Would you mind if I stayed here, with you? / Sora: Sure, if it'll make you feel better. / Ventus: Thank you. ^ Square Enix PDD 5 (September 7, 2010). Kingdom Hearts Birth by Sleep. PlayStation Portable. Square Enix, Disney Interactive Studios. Ansem: In fact, I would like to believe... Maybe he can set things right. A boy like him who touches so many hearts—he could open the right door, and save all those people whose lives I managed to ruin. So many are still waiting for their new beginning, their birth by sleep. Even me...and even you. / Aqua: What's this boy's name? / Ansem: His name...is... /.../ Aqua: Sora. ^ Square Enix PDD 5 (September 7, 2010). Kingdom Hearts Birth by Sleep. PlayStation Portable. Square Enix, Disney Interactive Studios. Riku: Your mind's made up? / Sora: Yeah. /.../ Sora: Kairi, I... it's just they really need me. I have to go. I am who I am because of them. / Kairi: See you soon. ^ Famitsu Staff (February 25, 2010). "Birth by Sleep: Special Interview with the Key Men of the Development Team!". Weekly Famitsu (in Japanese). Enterbrain: 128–131. ^ "Photophile - Kingdom Hearts Birth by Sleep". Game Informer. Cathy Preston (176): 125. December 2007. ^ a b c d e f g Kingdom Hearts Birth By Sleep Ultimania (in Japanese). Studio BentStuff. March 25, 2010. pp. 640–649. ISBN 978-4-7575-2788-1. ^ Gangan Staff (February 2010). "Interview with Tetsuya Nomura". Monthly Shōnen Gangan (in Japanese). Square Enix: 80–81. ^ Gantayat, Anoop (December 23, 2009). "Tetsuya Nomura Talks Kingdom Hearts Birth by Sleep". Andriasang. Archived from the original on December 26, 2009. Retrieved September 9, 2010. ^ "Kingdom Hearts: Birth by Sleep Q&A". GameSpot. July 19, 2010. Retrieved September 30, 2010. ^ a b Haynes, Jeff (August 2, 2008). "Kingdom Hearts Birth By Sleep Hands-on". IGN. Retrieved August 8, 2008. ^ "Square: Birth by Sleep & 3rd Birthday Development Status". PSP Hyper. June 8, 2009. Retrieved August 26, 2009. ^ a b Nomura, Tetsuya (October 28, 2009). クリエイターズメッセージ ＜野村哲也＞ (in Japanese). Square Enix. Retrieved December 2, 2009. ^ Jeriaska (August 31, 2009). "Interview: Magical Planet - The Music of Hiroki Kikuta & Yoko Shimomura". Gamasutra. Retrieved October 12, 2009. ^ ジャンプフェスタ2010 (in Japanese). Square Enix. Retrieved December 2, 2009. ^ a b "Kingdom Hearts: Birth by Sleep for PSP Reviews". Metacritic. CBS Interactive. Retrieved September 7, 2010. ^ a b c d Watts, Steve (September 7, 2010). "Kingdom Hearts: Birth by Sleep Review". 1UP.com. Archived from the original on August 30, 2013. Retrieved September 7, 2010. ^ a b Parkin, Simon (September 6, 2010). "Kingdom Hearts: Birth By Sleep". Eurogamer. Retrieved September 7, 2010. ^ a b Famitsu Staff (January 21, 2010). "Introduction of Kingdom Hearts: Birth by Sleep". Weekly Famitsu (in Japanese). Enterbrain: 47. ^ a b Vore, Bryan (September 7, 2010). "Kingdom Hearts BBS Review: Great Mechanics Undercut By Story Reboots". Game Informer. Retrieved September 7, 2010. ^ a b c VanOrd, Kevin (September 3, 2010). "Kingdom Hearts: Birth by Sleep Review for PSP". GameSpot. Retrieved September 3, 2010. ^ a b Antista, Chris. "Kingdom Hearts Birth by Sleep review". GamesRadar. Retrieved September 7, 2010. ^ a b c "Kingdom Hearts: Birth By Sleep, Review". GameTrailers. September 7, 2010. Retrieved September 8, 2010. ^ a b c Splechta, Mike (September 24, 2010). "Kingdom Kingdom Hearts: Birth By Sleep review". GameZone. Archived from the original on August 30, 2013. Retrieved October 11, 2010. ^ a b c Clements, Ryan (September 2, 2010). "Kingdom Hearts: Birth by Sleep Review". IGN. Retrieved September 2, 2010. ^ a b c d e f Antista, Chris (October 2010). "Kingdom Hearts Birth by Sleep: Have keyblade, will travel". PlayStation: the Official Magazine: 74. ^ a b Meli, Marissa (September 3, 2010). "Kingdom Hearts: Birth by Sleep Review". G4. Retrieved September 3, 2010. ^ a b c "RPGamer Kingdom Hearts Birth by Sleep review". RPGamer. Retrieved September 5, 2010. ^ a b "France's Japan Expo Award Winners Announced". Anime News Network. June 30, 2011. Retrieved April 28, 2012. ^ a b 電撃オンラインアワード2010結果発表 2010年一番おもしろかったゲームはコレ [Dengeki Online Awards - 2010 Results - The most interesting games in 2010] (in Japanese). ASCII Media Works. Retrieved February 12, 2011. ^ a b "Best PSP Games". GamesRadar. January 2, 2012. Retrieved April 28, 2012. ^ Tsutaya (January 12, 2010). "ＭＤ松尾のヒット解析：「キングダム　ハーツ」５０万本の好スタート　「バイオ」人気か". 每日JP.com. Archived from the original on August 30, 2013. Retrieved January 13, 2010. ^ Dengeki Staff (February 22, 2010). "【2月8日～14日のPSソフト売り上げ】40万本超の『GOD EATER』が1位". Dengeki PlayStation. Archived from the original on February 25, 2010. Retrieved February 22, 2010. ^ Cowan, Danny (September 10, 2010). "Saling The World: Kingdom Hearts: Birth by Sleep Heads U.S. PSP Sales". Gamasutra. Retrieved September 11, 2010. ^ Thorsen, Tor (October 14, 2010). "September US game sales slide 8%, hardware down 19% - NPD". GameSpot. Retrieved October 20, 2010. ^ Gantayat, Anoop (November 4, 2010). "Square Enix's Biggest Games Were Dragon Quest and Kane & Lynch". IGN. Retrieved April 28, 2012. ^ "PlayStation Awards 2011 Streamed". Anime News Network. November 30, 2011. Retrieved November 30, 2011. ^ "Top 10 PSP Games of 2010". 1UP.com. Archived from the original on August 30, 2013. Retrieved March 2, 2010. ^ Alexander, Leigh (January 6, 2010). "The Most Anticipated Games Of 2010: DS And PSP". Gamasutra. Retrieved October 14, 2010. ^ Caoili, Eric (January 7, 2009). "The Most-Awaited Games Of 2009: PlayStation Portable". Gamasutra. Retrieved October 14, 2010. ^ "E3 2010: Best of E3 Award Nominees". IGN. June 17, 2010. Retrieved June 17, 2010. ^ "Best PSP Game E3 2010". GameTrailers. June 25, 2010. Retrieved June 29, 2010. ^ "Game of the Month: September 2010". IGN. September 30, 2010. Retrieved September 30, 2010. ^ "The Top 25 PSP Games". IGN. September 30, 2010. Retrieved April 28, 2012. ^ Plunkett, Luke (November 17, 2009). "New Kingdom Hearts PSP Fit For Japan". Kotaku. Retrieved December 12, 2009. ^ Fahey, Mike (May 17, 2010). "Kingdom Hearts Birth By Sleep Dated, Detailed, And PSP Bundled". Kotaku. Retrieved May 17, 2010. ^ "book.キングダム ハーツ バース バイ スリープ アルティマニア" (in Japanese). Square Enix. Retrieved May 2, 2012. ^ "キングダム ハーツ Birth by Sleep Vol.1 Something Strange" (in Japanese). Square Enix. Retrieved May 2, 2012. ^ "キングダム ハーツ Birth by Sleep Vol.2 Best Friends" (in Japanese). Square Enix. Retrieved May 2, 2012. ^ "キングダム ハーツ Birth by Sleep Vol.3 To the Future" (in Japanese). Square Enix. Retrieved May 2, 2012. ^ "KINGDOM HEARTS Birth by Sleep & 358/2 Days オリジナル・サウンドトラック" (in Japanese). Square Enix. Archived from the original on August 30, 2013. Retrieved May 1, 2012. ^ Gantayat, Anoop (October 29, 2010). "Date Set for Kingdom Hearts Birth by Sleep Final Mix". Andriasang. Archived from the original on January 2, 2013. Retrieved October 29, 2010. ^ Young, Jason (September 16, 2010). "Square YouÃ¢â‚¬â"¢ve got Aya in my Dissidia! - News". GameZone. Retrieved October 23, 2010. ^ Gantayat, Anoop (September 16, 2010). "Square Enix Makes Big PSP Push". Andriasang. Archived from the original on July 28, 2011. Retrieved September 16, 2010. ^ Gantayat, Anoop (January 27, 2011). "Kingdom Hearts Tops the Charts". Andriasang. Retrieved April 25, 2012. ^ Gantayat, Anoop (February 10, 2011). "Ace Attorney Investigations 2 Tops the Charts". Andriasang. Retrieved April 25, 2012. ^ a b c Karmali, Luke (October 14, 2013). "Kingdom Hearts HD 2.5 Remix coming to PS3 in 2014". IGN. Retrieved October 14, 2013. ^ "Kingdom Hearts HD 2.5 ReMIX – Limited Edition Announced". Impulse Gamer. July 25, 2014. Retrieved July 25, 2014. ^ Donaldson, Alex (September 13, 2016). "Kingdom Hearts 2.8 to miss December, now out January 24th". VG247. Retrieved September 13, 2016. This page was last edited on 28 February 2019, at 20:05 (UTC).